Introducing the fiber laser range that outperforms the rest. Precise, flexible and fast to integrate – FOBA’s new generation of Yb fiber lasers are designed to meet the growing demand for reliable, accurate and efficient part marking and identification solutions. Furthermore, with nine different laser sources, it offers the broadest range of fiber lasers to meet virtually any application. For customers who need to integrate marking lasers into their production systems, the Y-series provides one compact modular system that fully integrates a wide range of lasers and optics, a patented vision system and standard customer interfaces. Customers with a diverse product range or who operate in a fast changing industrial environment, can benefit from an economic, one laser scan head solution that can provide the optimal configuration to meet their varying speed and quality requirements. Those customers who require precision and high accuracy, particularly those in the automotive and medical sectors need look no further. The Y-series fiber laser markers offer best-in-class mark placement and high quality marking through its new enhanced calibration method. The range’s new 20W and 2W ultra-short pulse MOPA (Master Oscillator Power Amplifier) marking lasers (Y.0201 and Y.0021) enable exceptional high contrast marking. Metals such as stainless steel, nickel, alloy, titanium, etc. can all carry high contrast marks through an ultra-short and adjustable pulse width from 4 to 200 nanoseconds. With an even shorter pulse width of 1.5 nanoseconds, the Y.0021 is ideal for medical part marking. The Y-series incorporates the newly developed CP10 scan head with an optional integrated vision system. There are two scan head tunings – High-S (for speed) and High-Q (for quality). These selectable scan head tunings allow a single marking system to be optimised for applications that either demand extreme speeds or the highest marking quality. The optional vision system IMP (Intelligent Mark Positioning) is directly integrated into the marking head. IMP is at the heart of FOBA’s vision aided laser marking process HELP (Holistic Enhanced Laser Process) which provides verification prior to marking and validation straight after. The validation process helps to avoid marking errors, reduces scrap and ensures reliability. Reliability is only one of the demands placed on today’s laser marking systems. Flexibility has become paramount as customer applications, requirements and materials now vary so widely and have become so complex. 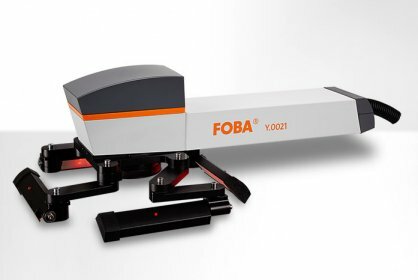 With the new Y-series, FOBA introduces a modular platform of nine compact and flexible fiber marking lasers spanning power and pulse range needs. The series provides customers with a tailored solution that gives optimal marking results, is easy to integrate within their production system and delivers cost-efficient processing. As FOBA’s product partners, TLM Laser are uniquely placed to provide the full story regarding this major step forward in laser marking systems.